Happy Hollow Weenie to all of my furiends, I hope you get lots of treats and no tricks today. Below is what mum thinks is a cute idea that a neighbor has in their yard for the hollyday, sutble but still cute. Why wouldn't witches and ghosties play ring around the rosie? Mum came home with a black cat last week, from somebody named Joann, all dressed up like a witch, pretty purple cape and holding a pumpkin. Mum had seen it in the store a while back but said she thought it costed too many green papers. But when she saw it the other day it was already marked way down, so she bought it. When she got it home she found out a surprise about this kittie which the video shows. Mum didn't know it played a song until she touched the paw to made the video. I could tell by the big smile on her face she was happy with it. I will be out and about the house during the day, mum says I can stay in the sleepy room while she hands out sweet treats to the sticky little people who will come by tonight. Have a great day. Plus mum has to get ready for feetsball on Sunday, number 4 is coming to Lambeau. Don't forgets Blog Blast for Peace next week on Thursday Nov 5. So you can see the count down timer to the right, and a blank Peace Globe for the upcoming day. I have one that is decorated for me that I will post on November 5. You can get your blank badge to make your own here. Mimi Lennox is the bean who has founded this movement a few years a go. We all need to support her. You only have a few weeks or so to get your Peace Globe, purrsonalize it and ready to post. You can do a blank you if you like, but I like to make it my own. If you scroll down on my sidebar you can see my previous Peace Globes. 1. 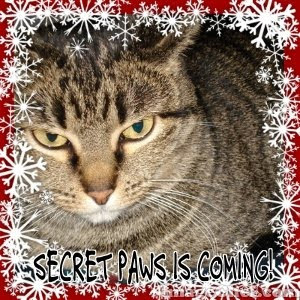 What is Secret Paws???? A. Secret Paws is a fun game! You submit your name by the deadline, and you will be paired up with your Secret Paw. Your Secret Paw won’t know who you are until the big day! Then you send them a nice Chrissymouse present in the mail (under $10.00). And guess what???? You will be someone’s Secret Paw too! And you will get a Chrissymouse present as a surprise! 2. Is Secret Paws fun? A. Of course! And it’s a nice way to celebrate Chrissymouse and make new furriends. 3. What’s the deadline for entering? A. The deadline to enter is NOVEMBER 14TH. PUT IT ON THE CALENDAR! 4. When will I know who my Secret Paw is? A. You will be emailed with the information before Thanksgiving. If you have anymore questions, submit them in the comments box, and I will answer right away! Cheysuli was upset that she didn't have any nicknames. Poor her. Just go and check it out, good stuff, made by hand and with love. It helps keep the Hotties in treats! Man I had a busy week last week with my purrthday and other stuff happening, so over the weekend I did lots of napping and a little bit of snoopervising while mum got rid of some of the leaves that have dropped off the trees. We had nicer weather over the weekend with sunny days and some decent temperatures. Unfortunately mum did not let me go outside, she was too busy doing stuff inside and away from home. Miles Meezer the Second is adopted. Mum checked the shelter website on Friday, he was still listed. On Caturday morning, his listing was gone. So happy that he found his furrever home fast as he wasn't on the website for more than a week! Miles 2, have a happy live in your new home. No mum was not out on the shelter webby site looking specifically for a fursib for me, but looking to see what we can do with the green papers that she plans to donate for my comment-a-thon from my purrthday and the TockTober pictures. The Pack - they won very nicely and the QB did not spend time getting tossed on his tocks. Brett and The Vikings - lost to the Steelers, thanks Steel Guys. The Colts - the won. Next Sunday Brett comes to Lambeau, so this should be interesting to see how he plays in front of the cheeseheads. On a sadder note I want to wish a fond farewell to Beezer, a fellow Gorgeous Ginger; Kimiko and BG, who all went to The Bridge in the past few days. See you again someday. When mum was out at my shelter's webby site the other day she took a look at the kitties waiting for a furrever home. She discovered another Miles Meezer! On the weekend before my purrthday it finally got nice, sunny and the temps warmed up to near 60 degrees. On Saturday mum let me out for a few minutes, but on Sunday mum let me stay out for over 15 minutes. Here are the highlights. At one point I thought I heard the rustling of a mousie in the grass. Plus you can see how far away from the house I got. Mum tried to keep herself between me and the spot where I could maybe slip outside of the fenced back yard. I can run faster than she can, so she won't let me get a head start. One of the first days I was here I did get out the front and into the neighbors yard, mum wasn't too happy with me on that. So if I get out it is only in the back yard and under snoopervision or inside my porch. Mum let me wander as it has freezed her, which means the fleas and ticky things are all deaded for the year. Thanks everyone for a wonderful turnout for my purrthday party. The comment-a-thon was a success. Since mum has to total the tock pictures for the whole month, she won't have a total of the green papers that we will donate until early November. I am tired, so I guess I will go back for another nap or 20. I think there are a few kitties sleeping it off under the beds, plus there is still some foods for snacks if anyone is around. Mum has agreed that for today on this post we will be doing a comment-a-thon. For every comment mum says she will donate to my shelter, the Humane Animal Welfare Society - HAWS. Every comment is worth fifty cents, one per kittie or kittie blog please, so for example, if The Crew came over, they are four kitties but one blog so that would be fifty cents worth. 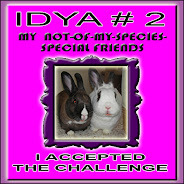 Plus, since it is Tock-Tober and Fiona and Orlando, my NOMSSF, they have asked that everycat, bun etc. try to post a 'tock picture. Mum asked that there be no bean tock pictures, don't want anyone to get caught doing something icky on the innerwebs. Mum says she will go through and count 'tock pictures and add some green papers for every 'tock picture too! Since some have already posted before, she will count all 'tock pictures posted in TockTober, so you have until the end of the month to post a 'tock picture. Let's see if we can break mum's bank account! She was at the shelter website the other night and was looking at their wish list. So she is thinking of getting one of their specific wishes if we gets enough green papers! Today I am now 6 years old, I guess I am almost senior catizen. Not sure I am ready for that! I still have a lot of kitten left in me. Mum would agree with that, I was running and jumping all over the place on Sunday. One end of the house, to on top of the sleeping spot and back to the other end of the house. We have an English saying today so I am off to be with Eric and Flynn today. Poor guys are locked up all month while their beans are gone. We will fool them and teleport out and go out into the nice English country side. So three tigers prowling! So I decided she needed to have an early wakeup call on Sunday. I jumped up on the beside table about 7 AM and knocked a bunch of stuff off, making lots of noise. Of course mum woke up, then couldn't get back to sleeps. So she got up, got my breakfast, her breakfast and started the laundry routine, then off to get our foods for the week. Once that was done she watched The Pack play, then she got wise and we had a nap together. The Pack - They WIN, Mum says they are still playing sloppy, too many penalties. BeauBeau and Angies's beans got to see a victory! Brett and them Vikings - Managed to squeak out a win. Them Raven's almost won but missed a FG at the end of the game. Stop back tomorrow, it's my purrthday! Yipee, the weekend is here. Mum got home right on time, she brought dinner home and I got some of it. Little bit of ham and turkey meat. Yum. Mum says we will have a quiet weekend, filled with doing stuff at home and naps. She says we need a weekend like this. We are also hoping to see a bit of sun this weekend too and maybe some warmer weather! It has been colder than it should be and I haven't had any open windows in ages. Hey, we kittie bloggers are known for supporting good things. Well PEACE is one the the bestest things we can supports. So you can see the count down timer to the right, and a blank Peace Globe for the upcoming day. I have one that is decorated for me that I will post on November 5. You can get your blank badge to make your own here. Yeah, we can certainly make ourselves scarce when we need to, avoid the chaos of the day, hide in plain sight with the stuffed creatures. It has gotten cold here. Mum spent time on Caturday getting her warmer clothes out for work. Washing all of the summer stuff and putting them away. The heaty monster in the dungeon is running more often now. The plants outside have been nipped by Mr Frost and Freeze. Mum says she will have to start clearing things out the deaded stuff before winter. Brett and the Vikings - they won and belated Happy 40th Purrthday to Brett Lorenzo Favre. The Colts - were winning when mum went to bed, the game was not over. Mum drives me crazy sometimes. I am all nice and comfortable on the sleepy spot and she thinks she has to bury me after she washed the sheets. Right in the middle, nothing for reference just that green cloth under and over me. Hey, don't put the sheet down! I can't see. Which way do I go? Mum? Which way is out? I made it too the edge of the sleepy spot, whew, now I just have to jump down. Yep, there is the floor, I'm outta here! Happy weekend to one and all. Major snuggle weekend here, the weather guesser says we might see snowflakes in the next few days. Mum is not happy to hear that but it won't be enough to have to clear off. Plus I gotta keep purring for my furiends. Mr Tigger (get home dude), Mittens, Aunty Deb is having surgery soon, I am sure I am missing somecat here, or somebean. 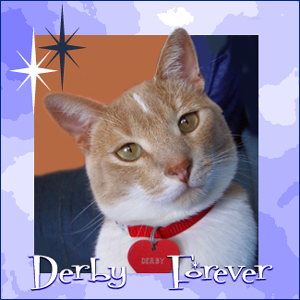 I always do my purrs morning and night and include all the gang of the Cat Blogosphere, get well, come home, find a home etc. Guess I will start off with the feetsball report. The Pack lost to Brett and them Vikings. Surprisingly mum was not yelling at the moving picture box, more groaning and sighing. She says you can't win when you QB is spending time getting tossed on his 'tocks! Oh well, mum said. The paper said #4 is #1. You can see that mum has the ginger flowers back in their spot. I like to jump up on this little thing. It is also where mum used to keep her Gallileo thermometer before it gotted broked. Oh well, it is getting furry windy, I can hear the chimes outside making lots of noise. That won't bother me, I will just nap. Sort of like Sweet and Sour, Hot and Cold, we all have opposites. Normally mum is happy with me, but yesterday I did something, now she is not happy with me. Yesterday she went to get Grampie for church, then I guess she took him out to lunch. We she gotted home she went out to use the grass eating monster. Well while she was outside, I decided to, ummmm, redecorate the house a little. Like George of The Crew and his art, make an artistic statement. Mum was not happy. See I pushed the flower holding thingy down so I could have the nice ginger flowers on the floor with me. Well, it hit that silent, white cat the mum brought home a few months ago. I never cared for that kittie at all! Well, the silent cat lost its head in this and mum decided that she didn't want to try to fix it. Plus she thought she had it in the one spot in the house I couldn't push it over. She didn't expect me to get at if from above! So mum took the white kittie away and put everything back, then I pushed the ginger flowers down again. I then retreated to the sleepy spot to get away from her! Fine, you aren't happy! I am happy that the silent, white kittie is gone, and I show you my 'tocks! Get ready for some Monday Night Feetsball. The Pack in a showdown with their former QB, Brett. I am sure that there will be shouting and swearing at the moving picture box by mum if things don't go well for The Pack. I will go find a quiet place to nap.